Santa Barbara County remains one of the most exciting regions in California. As I have written here before, Santa Barbara is home to an extraordinary range of wines; from cool-climate, ocean-influenced Chardonnays, Pinots and Syrahs, to richer Sauvignon Blancs and Bordeaux-based reds, and everything in between. But it’s more than just the wines. Santa Barbara is driven by an intriguing interplay of the old and the new, all seen through the prism of a rich cultural fabric with influences from Old World European, Chumash Indian and Latino traditions. Each year I spend more time in Santa Barbara, but it never seems to be enough to cover the multitude of projects that seem to pop up, seemingly with no end. One of the real hot spots for emerging talent in California, Santa Barbara is full of young winemakers blazing their own trails. Many of them are attracted to the area’s rich legacy of historic Chardonnay and Pinot Noir sites and the relatively low cost of sourcing fruit and getting a small project off the ground, something that is prohibitively expensive in other parts of the state. Bien Nacido and Sanford & Benedict, both first planted in the early 1970s, remain two of the oldest vineyards in the United States. In recent years, new owners including Bill Kimsey, John Hilliard and Christine Bruce and the Murphy family have brought with them the ambition to make world-class wines and the economic firepower to pursue that goal with no expense spared. The acquisition of Brewer-Clifton by a private equity group, Stan Kroenke’s purchase of Rancho Salsipuedes, Walt’s long-term lease at Clos Pepe and Charles Banks’ investments in Sandhi and Qupé are all further signs that point to a heightened level of interest that is percolating throughout the region. Santa Barbara is hot; there is no doubt about it. Most of the current releases on the market are 2013s. The second vintage in the current drought cycle, 2013 got started early, with a warm, dry spring and temperatures that remained above average throughout the growing season. But there were no severe heat spikes. And vines, like people, hate shocks. Harvest was early by several weeks. Or maybe 2013 is the new normal. We will see. Both 2014 and 2015, which is underway as I write this, have started even earlier! Yields in 2013 were on the generous side, which took a lot of growers by surprise. Most often, vines self-regulate. Abundant years are usually followed by smaller crops and vice versa. But in 2013, growers got their second huge crop in a row, and that created some issues. The vintage seems to have two clear winners; Chardonnay and Syrah. Of the two, Chardonnay is the most surprising, because warm, early-ripening growing seasons aren’t usually considered optimal for white grapes, but the 2013 Chardonnays are gorgeous. I suspect a good many wines have been acidified, but the end results so far are strong, and that counts for a lot in my book. Syrah, which tends to ripen late, is also highly successful in 2013. Cabernet Sauvignon and Bordeaux varieties more broadly play less prominent roles in Santa Barbara than they do in other parts of the state, but it is fair to say 2013 is a strong year for those varieties as well. Pinot Noir is the clear outlier in 2013. Quality is erratic, although I did not taste as many diluted, thin wines as I did in 2012. As one of the area’s most respected growers said quite candidly “we simply did not expect yields to be as high as they were.” That, in a nutshell is 2013 for Pinot Noir. High yields are the kiss of death for Pinot, which needs to be cropped low to fully express vineyard signatures. Still, I would classify 2013 for Santa Barbara Pinot Noir as above average, although there are fewer compelling Pinots than in a top vintage, especially considering the inherent quality of the region’s best vineyards. So far, I have tasted just a few 2014s, but early signs are encouraging. Santa Barbara County currently encompasses five AVAs (American Viticultural Areas); Santa Ynez Valley, Happy Canyon of Santa Barbara, Ballard Canyon, Sta. Rita Hills and Santa Maria Valley. One of the biggest factors that determines the personality of each region is distance to the cooling effects of the Pacific Ocean. The western areas are cooler, while the eastern reaches are warmer. 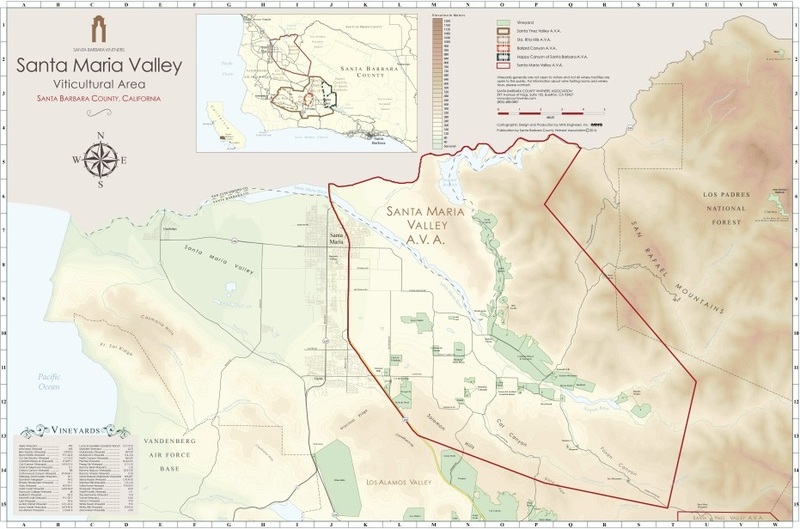 The Santa Maria Valley lies to the north, with the Santa Ynez Valley just south. 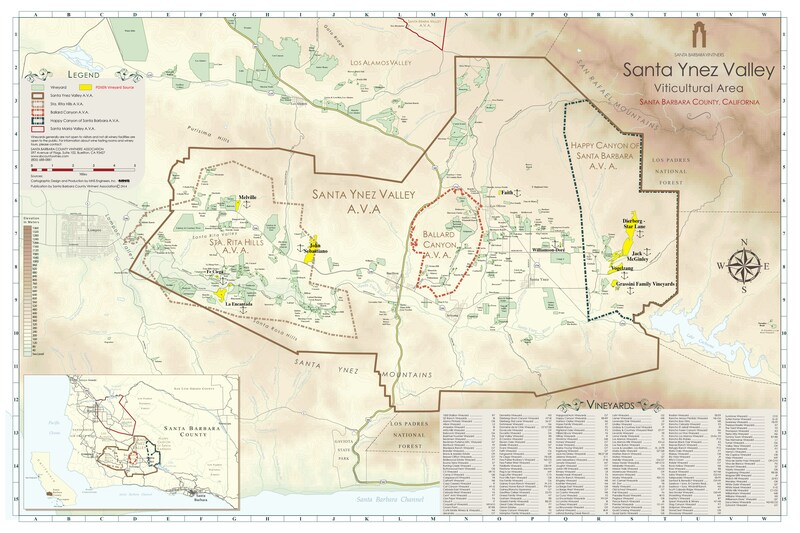 Over the years, several newer AVAs have been carved out of the larger Santa Ynez Valley AVA. The most recent of these is Ballard Canyon. 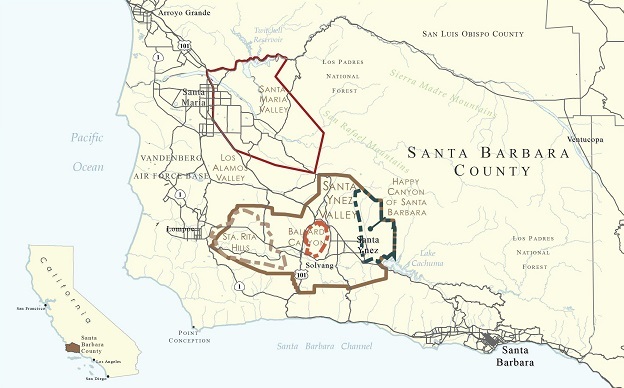 The maps below, from the Santa Barbara Vintners, offer a good starting point for getting to know the area better. Like all maps from regional trade groups, these maps include only the vineyards of its members and are therefore not complete. Even so, the maps are quite detailed and nicely done, hence their inclusion here. 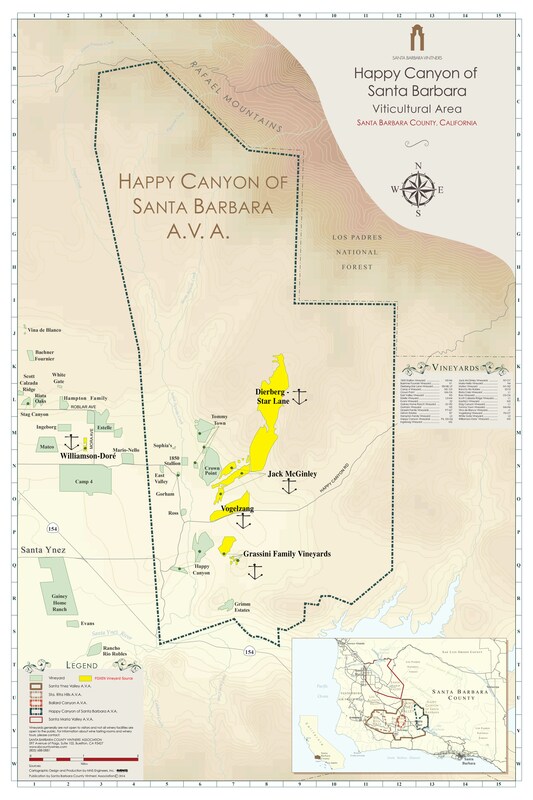 Happy Canyon (outlined in black) lies on the eastern edge of the Santa Ynez Valley and is also the warmest of the five AVAs. Bordeaux varieties, namely Sauvignon Blanc and Cabernet Sauvignon, find hospitable conditions here. The Sauvignon Blancs come in all styles, depending on clonal mix and winemaking approach. The Cabernet Sauvignons and Cabernet-based reds have a very distinctive flavor profile redolent of herbs, pungent dark fruits, leather, cedar and tobacco. The most famous vineyards in Happy Canyon are Dierberg – Star Lane, McGinley, Vogelzang and Grassini. Moving west into the areas surrounding the cities of Santa Ynez and Los Olivos is a bit of a no-man’s land with a little bit everything. The best sites are Foxen’s Williamson-Doré, Camp Four, Brander and Honea, with Curtis, Demetria and Fess Parker’s Rodney’s Vineyard all at the very top of the appellation. Joey Tensley’s home vineyard in Los Olivos (not pictured) shows promise as well. Fred Brander is leading the effort to gain approval for a Los Olivos AVA, which would certainly help in giving that area its own identity. 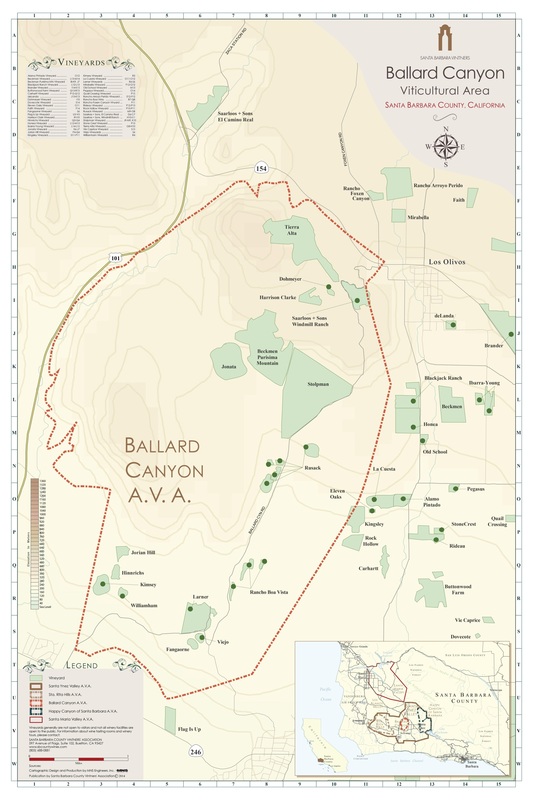 Ballard Canyon, Santa Barbara’s newest AVA, excels with Rhône varieties. Entering from Los Olivos on Ballard Canyon Road, the swooping hills of the appropriately named Tierra Alta come into view, followed by Harrison Clarke. Lower on the flats is the beginning of the Stolpman/Beckmen-Purisima Mountain/Jonata sector, a series of gently sloping hillside vineyards that are next to each other. Rusack, Larner and, more recently, Kimsey, round out the vineyards of note as you make it out to Route 246. Ballard Canyon excels with Syrahs that offer notable fruit density but also aromatic nuance. 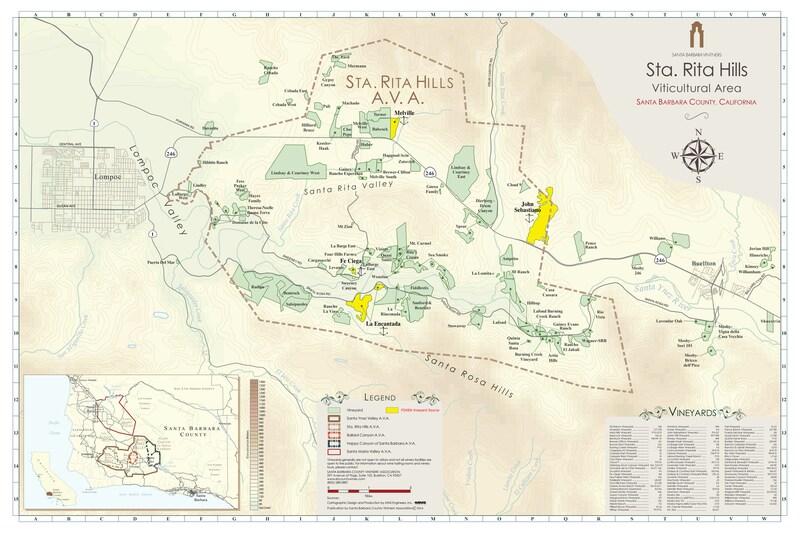 The wines aren’t generally as intense or ripe as Syrahs from Paso Robles, but they aren’t as peppery or savory as Syrahs from cooler microclimates such as those found in the Sta. Rita Hills or the Sonoma Coast, either. The best Ballard Canyon Syrahs offer an attractive interplay of warm and cool climate characteristics. Turning right on Route 246 and heading north lie the Sta. Rita Hills AVA, starting with John Sebastiano, one of the most singular vineyards in the area. Pinot is planted within the part of the vineyard that is in the Sta. Rita Hills, while Rhone varieties are planted just outside of the boundary. 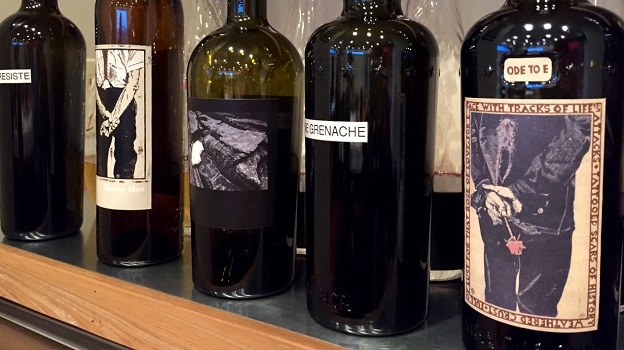 Dierberg, Melville, Babcock, Turner, Clos Pepe, Kessler-Haak, Machado and Zotovich all yield wines of pedigree, as does Hilliard Bruce, just to the west. Three fascinating clusters of vineyards are found on the other side of Route 246. The first of these centers around Sanford & Benedict. First planted in 1971, S&B is one of the most historic vineyards in Santa Barbara and still one of the very best. Sanford & Benedict is surrounded by La Encantada, La Rinconada and Fiddlestix, all of which produce deeply intriguing Pinot Noirs. Standing in Sanford & Benedict, the strip of rugged, windswept mountain vineyards that starts at Sea Smoke and finishes at Cargasacchi is visible. The most interesting of these sites are Rita’s Crown, Mt. Carmel, Wenzlau, Fe Ciega and Sweeney Canyon. In my view, Sea Smoke belongs with the best vineyards in this sector because of its potential, even if much of that potential remains untapped. Another interesting set of vineyards forms off Santa Rosa Road on the southern edge of the appellation. 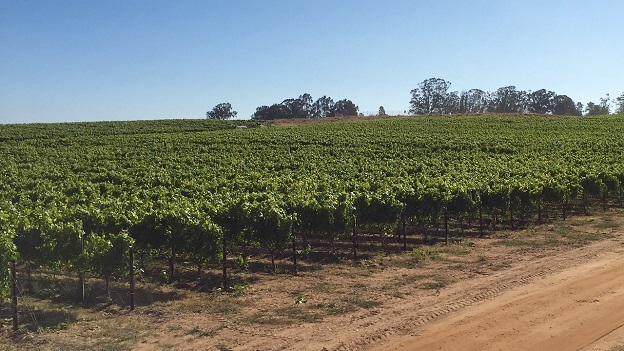 Late last year, Stan Kroenke, owner of Jonata and Screaming Eagle, purchased Rancho Salsipuedes, a 3,600 stretch of land that includes Puerta del Mar, Bentrock and Radian among its 200 acres of vineyards, yet another indication of the growing interest in the Sta. 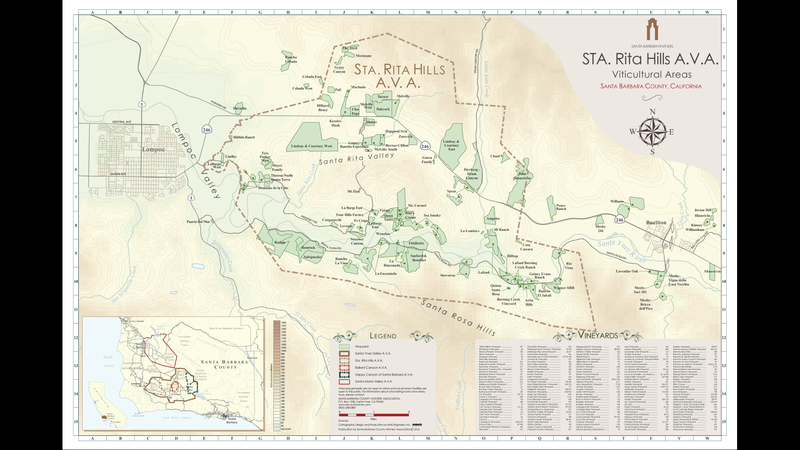 Rita Hills and its wines. The last set of sites of note is found at the very western edge of the Sta. Rita Hills, where Domaine de la Côte has developed vineyards in what are considered some of the coldest, most marginal sites in the appellation. Pinot and Chardonnay struggle to ripen in these hillside sites. The true potential of these vineyards over the long term remains to be seen, although I do worry some of the sites might be too marginal. Time will tell. 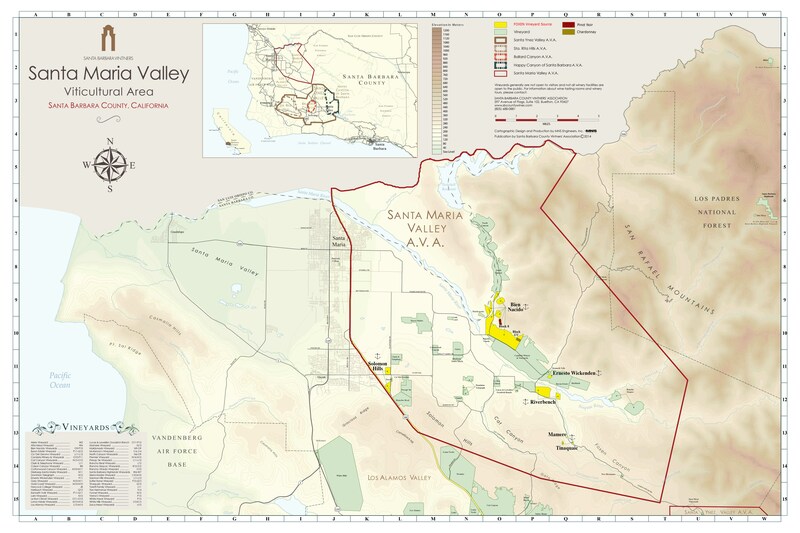 As the maps show, the Santa Maria Valley is a region unto itself. Here readers will find extraordinary Chardonnays, Pinot Noirs and Syrahs of tension and crystalline purity. Jim Clendenen and Adam Tolmach were among the first to make compelling wines here in the early days of Au Bon Climat and continue to do so today, Clendenen at ABC and Tolmach at Ojai. Top vineyards sites include Solomon Hills, Sierra Madre, Le Bon Climat, Foxen’s Ernesto Wickenden and Tinaquaic, and the most famous of all, Bien Nacido. At their best, Santa Maria wines easily compete with the very finest anywhere in the United States. The Los Alamos Valley lies in between Santa Maria and Santa Ynez and is home to a number of interesting vineyards, including Los Alamos, White Hawk and Sine Qua Non’s Third Twin (not pictured). I am always concerned with overwhelming readers with too much information. This article alone contains several hundred reviews. The brief list of highlights below is not meant to diminish all the other estates and wines that are covered in this article, all of which merit consideration, but if you ask me what is truly special this year, well, this is it…in no particular order. As always a handful of producers are missing from this article for various reasons. Arcadian had no new releases to show, while Dragonette had just bottled at the time of my visit. La Barge and Sea Smoke both chose to not show their wines, which means we will buy them and I will taste them in our office at my earliest convenience. I also missed Clos Pepe, which is my own oversight, but will take care of that as soon as possible.